Use all the tips and try to kill all the enemies and be sure that you will cope with it. Watch out! They are already coming! Just try to stay alive as long as possible and you will be our hero. All these zombies are coming! So, enjoy the game. 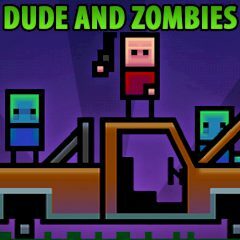 This amazing Dude and Zombies game is another bloody zombie shooter. So, as you have already understood, you are stuck alone in the middle of nowhere. Could you believe that? That is why you must defend your life against crowds of hungry zombies and develop better skills while assembling the car. Dude, get the hell out of there or just die! Use your gun and shoot like the last time. Get money and upgrade your brave character. Have no doubt, you will kill them all! Be sure that you will cope with it. Just kill them right now!